L-R: Prof. Chinyere Ezeaka, National President, Nigerian Society of Neonatal Medicine (NSONM); Prof. James Rener, Chairman, Nestle Nutrition Institute, Africa; Dr. Rizwan Yusuf, Category Manager, Maternal &Nutrition, Nestle, Nigeria; Mr. Mauricio Alarcon, Managing Director/CEO and Mrs. Onabajo Simidele, Representative of Director-General, National Agency for Food and Drug Administration and Control (NAFDAC), at post-graduate programme in Pediatrics Nutrition in Lagos, recently. To tackle neonatal and infant mortality among other poor health indices, some experts say that emphasis should be placed on optimal nutrition education and counseling. They said that this must start with exclusive breastfeeding. According to them, a lot of issues around nutrition will be resolved if nutrition education and counseling begins with exclusive breastfeeding to address the needs of children from birth to 28 days and subsequently as infant. 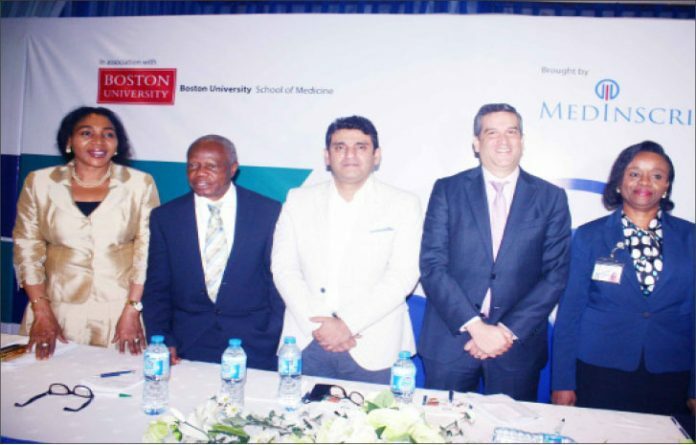 The experts spoke recently, during a “Symposium and Convocation of Post Graduate Programme in Pediatric Nutrition,” an educational initiative supported by Nestle Nutrition Institute, in association with Boston University School of Medicine and Medinscribe, in Lagos. She maintained that there is need to change food practices and behaviours, as well as incorporate nutrition counseling and education in health delivery services. “Nutrition education is any “combination of educational strategies, accompanied by environmental supports, designed to facilitate voluntary adoption of food choices and other food and nutrition related behaviours conducive to health and well-being. “Nutrition and counseling education are used to provide guidance to individuals on how to develop or change food practices and behaviours to meet their nutritional requirements and improve their health,” the Professor of Paediatrics said. She lamented, “In spite of the benefits of nutritional counseling, many physicians lack the requisite education and training in medical nutrition therapy to counsel their patients and to ensure continuity of nutrition care across healthcare providers. “Therefore providing healthcare providers guidance on nutrition counseling and education is of paramount importance. “This is also where motivational interviewing comes in. “Motivational interviewing is a patient-centred counseling style that seeks to elicit internal motivation to change their behaviour and encourage them to understand and resolve their ambivalence about behavioural change. “Motivational interviewing is regarded as a promising approach to nutrition counseling,’’ Ezeaka said. Presenting a paper on “Establishing Healthy Food Habits in Children,” Dr Clifford Lo, Adjunct Professor of Nutrition, Children’s Hospital Harvard Medical School, U.S, said it was important to establish healthy food habits early in life. Lo, who represented the Boston School of Medicine , said, “The early years of life are characterised by rapid developmental changes in eating habits. “Infants begin to develop flavour preferences in the utero, through the amniotic fluid, long before they taste solid food. “Postnatally, flavour learning continues through breast milk, with the introduction of complementary foods, infants further develop food and flavour preferences. “The dietary patterns learned during the early years of life track into later childhood and adulthood and form the basis for future eating patterns. “Consequently, it is important to establish healthy food habits and dietary habits early in life,” the Adjunct Professor of Nutrition added. According to him, healthy eating is essential to obtaining adequate amounts of nutrients required for good health, growth and development, as well as achieving and maintaining a healthy weight. Lo also said it was also essential to reducing the risk of developing chronic diseases and premature mortality. Responding, Chioma Emma-Nwachukwu, Manager, Anglophone Speaking Countries, Central and West Africa, Nestle Nutrition Institute Africa, said the programme would help equip healthcare providers with needed knowledge on nutrition and associated issues. “The healthcare professionals don’t have enough nutrition training during their medical training, so, this programme is aimed at closing the gap. Emma-Nwachukwu further said; “In Nigeria, there is still opportunity to change the landscape on nutrition because there is a lot of malnutrition and micronutrients deficiency. She added, “In Nigeria alone, for this session, we have trained over 300 healthcare professionals and the graduation is taking place in Lagos and Abuja. “We started the programme last year and more participants have joined based on the good reports from the programme as a result of the quality, modulus and relevance to their clinical practice. “Since its inception, we have reached over 500 healthcare professionals and they in turn have reached over 6000 through their step down activities,” Emma-Nwachukwu said. Dr Osinowo Opeyemi, one of the participants, praised the organisers of the training. According to her, malnutrition is a major problem in this part of the world and it is better to start addressing it early from childhood. Dr Opeyemi said she had learnt a lot and was well-equipped to provide advice on nutrition matters.